Thunder in Paradise was an unreleased game based on the TV series featuring Hulk Hogan. It was in development by Software Toolworks. Scans courtesy of KingMike. Thunder In Paradise was a short lived action series featuring Hulk Hogan. The premise of the show was two ex-Navy Seals (one played by Hogan) travelling around the world in their hi-tech boat fighting crime. As one might expect, the series only lasted one season. In addition to this unreleased SNES game, there was also an unrelated interactive FMV game released on the CD-i. The Super NES game was previewed in the October 1994 issue of EGM. 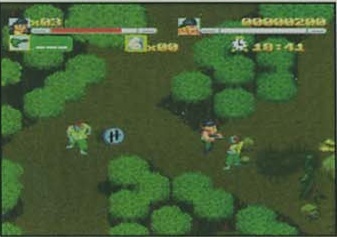 The screenshots show there were going to be at least three gameplay modes: shooting from the boat, side scrolling action, and overhead action. The graphics do not look too bad, but the side scrolling level looks more incomplete than the boat and overhead levels. 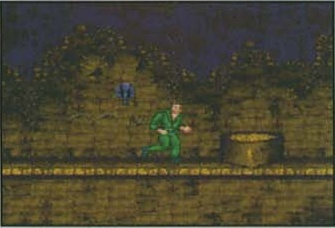 The show was cancelled in late 1994, ending any chance this game had for release.